Whispers in the Loggia: In Philly, Senior Makes Four... Again. Good morning, River City... and, just like that, we've got another one. This morning, Pope Benedict named Msgr Timothy Senior, 49, vicar for clergy in the archdiocese of Philadelphia, as auxiliary bishop of the 1.5 million-member local church, the nation's seventh-largest. Raised in the five-county fold's outer reaches, the bishop-elect has spent most of his 24-year priesthood on Headquarters duty. With advanced degrees in both social work and management to his name, after seven years leading the city's Catholic Social Services -- Pennsylvania's largest provider of aid to the sick and needy -- the classically-trained pianist was named to head the all-crucial Clergy Office in 2004, serving throughout as chaplain-in-residence to a home for disabled women alongside his desk-work. Long seen as the logical heir to Bishop Joseph Cistone at the helm of the archdiocesan administration, Senior's appointment comes 19 days after the longtime COO's transfer to Saginaw, where he'll be installed on 28 July. With some 1.5 million Catholics on the books, the move returns the number of active auxiliaries in Philadelphia to four. Among them, however, the well-loved Bishop Robert Maginnis is serving past-time, having reached the retirement age in December 2008. 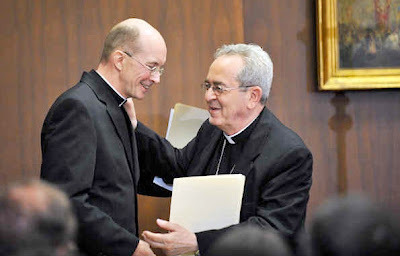 In keeping with custom, the naming of Cardinal Justin Rigali's newest top deputy was specifically timed for today -- the 24th anniversary of Rigali's own elevation to (arch)bishop alongside his appointment as president of the Pontifical Ecclesiastical Academy, the Holy See's training ground for its future priest-diplomats. A double-alum of Jesuit-run Boston College, Senior will be ordained to the episcopacy on 31 July -- the feast of St Ignatius Loyola -- in the Cathedral-Basilica of Ss. Peter and Paul. I love being a priest! As a priest, I have encountered the abiding and irresistible love of God drawing me ever more deeply into relationship with Him. In my life as a priest, I have been given opportunities to grow and to serve that I could not have imagined or planned for myself. The life of a priest is challenging and fulfilling in countless and surprising ways. I am confident that my future ministry as a bishop will be the same. I thank God today for the grace of perseverance and I pray for the ever deepening desire to do His will and to give my life completely in the service of His Church. Now, I am eager to move forward – to prepare for my ordination and ministry as an Auxiliary Bishop. I am encouraged by the words of Saint Paul to my patron saint, Saint Timothy, when he challenges him to “stir into flame the gift of God bestowed when my hands were laid on you!” Please pray for me. Pray that my weaknesses and shortcomings will not impede the fulfillment of God’s holy will in my life through my ministry as a bishop. Please join me in praying that like Jesus, the good shepherd, I will always be in the midst of my brother priests and the people of God “as one who serves.” I beg the intercession of Saint John Neumann and Saint Katharine Drexel. May our Blessed Mother, Mother of Divine Providence, continue to lead all of us ever more fully into the mystery of the death and resurrection of her Son, our Lord Jesus Christ, in whom we glorify God and in whom we are fully alive! ...and, for the extra-curious, presser video.